Huawei ambassador Gal Gadot was revealed to have been tweeting with an iPhone a long while ago and if you thought that was bad, you'd be shocked, as an official Samsung account was caught parading the streets of Twitter with an iPhone in tow. Popular tech Youtuber Marque Brownlee’s tweet a few days ago was hilarious and got a lot of media attention. “Might as well add "Twitter police" to my bio at this point,” the tweet read, and topped things off with a facepalm emoji. For the second time, MKBHD revealed an Android personality account that was sending tweets from...that’s right, an iPhone. This time, it wasn’t just a random Android related account. Earlier this year, it was Huawei ambassador and Hollywood wonder woman Gal Gadot who was caught sending tweets from an iPhone. This time, though, it was something a bit bigger: an official Samsung account. 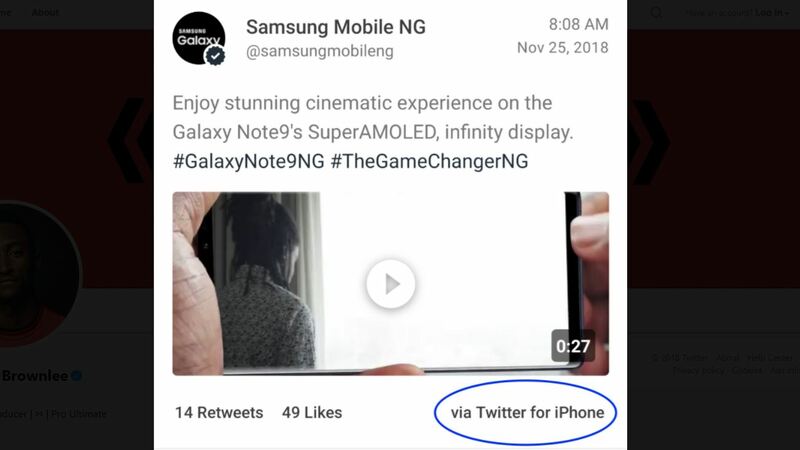 While Samsung Nigeria's official Twitter account sending out tweets from an iPhone is all sorts of bad for business—and even more so now that it has been pointed out by an influencer—it’s really nothing special at the end of the day. The chances of the person behind the tweet being an actual Samsung staff are infinitesimally low, and it’s a lot more likely that the account was being run by a social media management agency. Still, this doesn’t look good on Samsung, and contracts are sure to have been terminated. It's also not even the first time something like this has happened with Samsung, as just two months ago, a Samsung brand ambassador was also caught using an iPhone X in public. Really makes you wonder what they all see in Apple.